Our sweet, slow-smoked hams are fully cooked in their own juices. CURED WITH: Water, Contains 2% or less Dextrose, Salt, Potassium Lactate, Corn Syrup, Sodium Phosphates, Brown Sugar, Sodium Diacetate, Sodium Erythorbate, Sodium Nitrite. Serv. Size: 3 oz(84g), 64 Servings, Amount Per Serving: Calories 140, Fat Cal. 70, Total Fat 7g (11% DV), Sat. Fat 2.5g (13% DV) Trans Fat 0, Cholesterol 45mg (15% DV), Sodium 760mg (32% DV), Total Carb. 4g (1% DV), Dietary Fiber 0g (0%DV), Sugars 2g, Protein 15g, Vitamin A (0% DV), Vitamin C (0% DV), Calcium (0% DV), Iron (4% DV). This ham is not glazed. To add your personal glaze choice, please follow the recipe or manufacturer's instructions for glaze preparation. 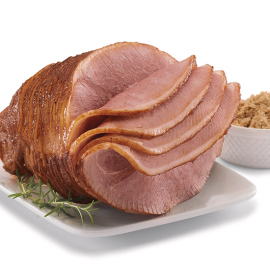 I've tried just about every spiral smoked flavor packed ham there is and this ham is the best ever! So sweet without being to sweet, juicy to the bone. I have to admit, I will choose this over a honey glazed every time! My contribution to out family Thanksgiving was ham. This year I prepared the Smithfield brand Spiral cut with brown sugar glaze. I can honestly say the ham it was a big hit and was preferred over the traditional turkey. I went well together with all the traditional sides too. I bought another one to go towards the Christmas dinner. 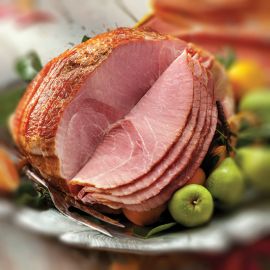 If you like hams slightly sweet, not too salty and not too 'honey' this is a GREAT choice. It is a family favorite for Christmas and we eat every scrap. The meat is firm, not tastelessly wet like many 'city' hams, but not dry as country ham. The flavor is nicely balanced and it goes really well with homemade mac and cheese. I skip the glaze packet and make my own simple honey, mustard, and brown sugar glaze. This is a winner for those wanting something less dry and salty than country ham, yet with really nice flavor and texture.